STEAM activities encourage kids to incorporate 5 components (Science, Technology, Engineering, the Arts, and Math) into learning. STEAM activities compel kids to use critical thinking skills to inquire and explore solutions to the wonders in their everyday world. 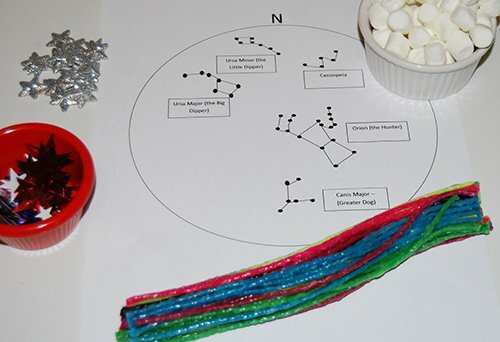 Come explore the stars in the night sky with a creative Wikki Stix constellation design challenge for kids! Stargazing is not only fun for kids, but it is an activity the whole family can enjoy together. The night sky can best be viewed on a clear night away from the bright lights of the city. To show kids some of the familiar constellation patterns, download and print BASIC CONSTELLATION PATTERNS here. 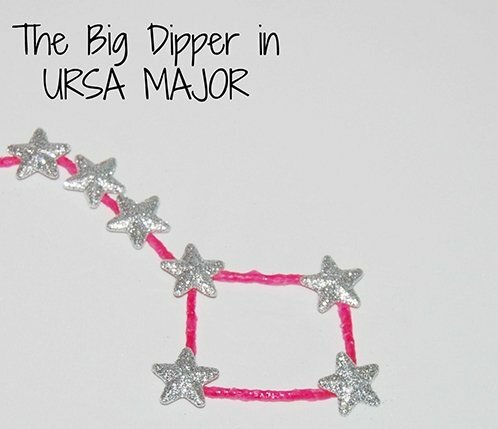 URSA MAJOR: “Great Bear” – this constellation contains The Big Dipper and points to the north. URSA MINOR: “Little Bear” – this constellation contains The Little Dipper and Polaris (commonly known as the North Star). 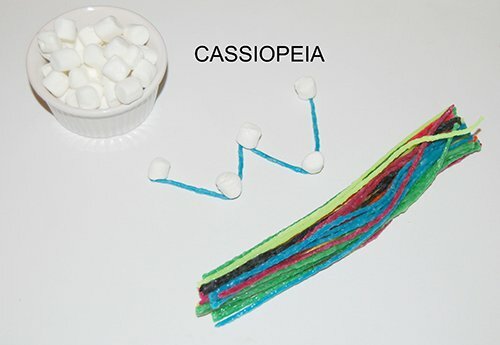 CASSIOPEIA: Cassiopeia is well-known for its “W” shape and is made from 5 stars. Cassiopeia borders Andromeda to the south. ORION: Orion is known as “the Hunter” because the star patterns resemble a hunter with a bow. CANIS MAJOR: “Greater Dog” – this constellation houses Sirius (the brightest star in the night sky). After the children are familiar with the basic constellations, invite them to a constellation design challenge! Constellation Design Objective: to engage kids in using foundations of the scientific method to construct familiar constellations in the night sky. Constellation Design Inquiry: Can the children construct constellation patterns using Wikki Stix, Scissors, and Marshmallows or Stars? Invite the kids to create by placing all supplies out on a table or a large tray. 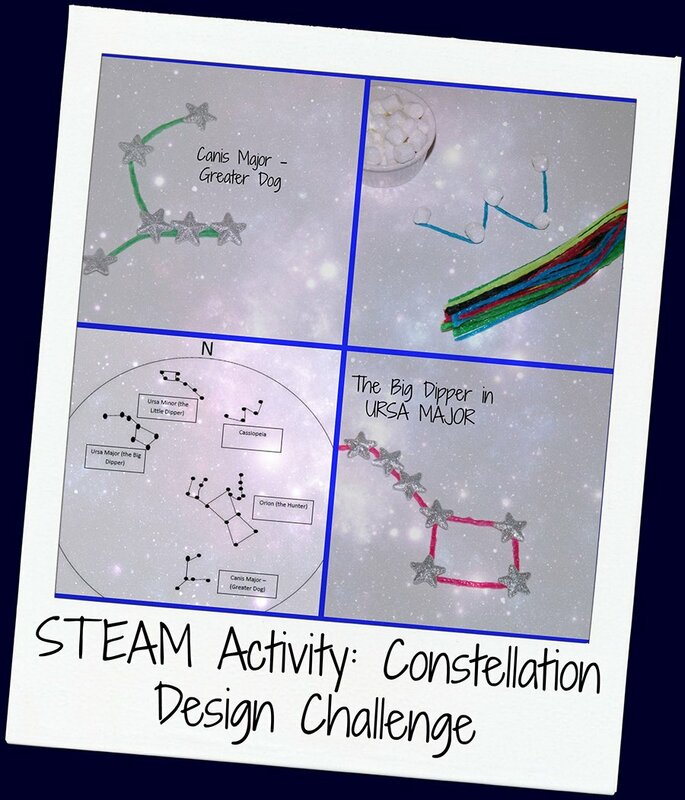 The kids can look at the constellation template to design which design they wish to create. 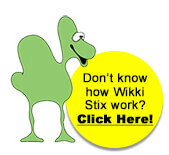 In creating the Wikki Stix constellations, kids had to estimate pattern lines, cut the Wikki Stix, decide how many stars, creatively duplicate constellation patterns using fine motor skills, predict where the stars should go based upon the size of their model, test the model to see if the marshmallows or stars would fit on the current design, and resize the model if necessary. It is amazing to observe children creating and using critical thinking skills! To find out more about the night sky and other constellations, the Star Walk Kids by Vito Technology is a great way to incorporate digital technology into learning. Scan the QR code to see the app on Google Play. For iPhone, iPad, or iPod, scan the QR Code to view the app on iTunes.